Getting a share of the corporate dollar is a concern of all Latino organizations, including nonprofits. The question is often framed in turns of corporate responsibility: Are Latinos getting an equitable amount? But in today’s tough ecomomic climate, philanthropy involves more than just writing a check. If the rules of the game have changed, then what should Latinos know to receive a fair share of this corporate largesse? Philanthropy, a word that has been redefined over time to refer to the voluntary giving by individuals or groups for a common good, is a deep-seated tradition in the United States. There is the long-practiced Native American tradition of the “giveaway,” and the example of the support for schools, churches and other community services by early colonists to North America. Benjamin Franklin is recognized as an early philanthropist, founding a volunteer fire company and setting up a public library in Pennsylvania. Philanthropy began to acquire its more modern profile in the late nineteenth and early twentieth century when wealthy businessmen began using their riches to benefit the needy. In 1867, financier George Peabody established the Peabody Fund, and today, Andrew Carnegie and John Rockefeller are still recognized as great American philanthropists. As might be expected, anything that has to do with the distribution and sharing of money and resources has become a multi-faceted and much-studied field. 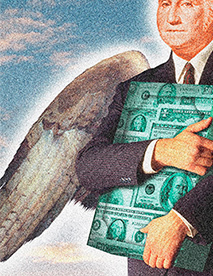 One facet that has come under increasing scrutiny is the philanthropy practiced by companies. According to the glossary of terms in philanthropy published by the Donors Forum of Chicago, “a corporate (company-sponsored) foundation is a private foundation that derives its grantmaking funds primarily from the contributions of a profit-making business.” These are legally separate organizations, often with endowments and maintaining close ties to the “donor” company. It defines a “corporate giving program” as “a grantmaking program established and administered within a profit-making company.” They do not have a separate endowment; instead, their gifts are part of the company’s annual budgeting process. In this country, giving by individuals significantly far outpaces corporate contributions. In its The Nonprofit Almanac 2008, the Urban Institute, a nonpartisan economic and social policy research center, reports that individuals donated $222.9 billion in 2006, while corporations donated $12.7 billion, representing just over 4 percent of all charitable contributions. Still, we want to know what corporate America is doing with its money to help those in need; and if we are affiliated with a nonprofit organization or charitable group, we want to know how to capture some of those funds. We might also be asking ourselves why corporations are in the grantmaking business in the first place. This desire to do good while continuing to turn a profit is still true, but grantmaking strategies among corporate funders have been shifting over the years. Today, giving objectives are less subject to a top executive’s personal preferences and have given way to professional staffs and active boards and employees. Experts in the field of philanthropy see a definite move away from “checkbook giving.” Funders want to make an impact and are taking a new look at how better to spread the wealth. This move toward “strategic giving” is also related to another trend—partnership building. This has implications for Latino nonprofits, particularly when it comes to building capacity, advocating for social change, impacting policy or solving complex problems. Because corporations are interested in the return on their investment, “they want to create strategic partnerships, long-term partnerships. They want to get invested in the organization [they are supporting],” notes Catherine Pino, cofounder and principal of D&P Creative Strategies. By engaging in in-depth, multi-year projects, funders and charitable groups can sustain resources directed at an issue with a greater chance of coming up with real solutions or substantially contributing to the body of knowledge on an issue. AT&T Foundation is focusing on education. “We are very concerned that the United States retain its global competitiveness,” explains Sanford. She points to the foundation’s Empower Hispanic America with Technology program as an example of a strategic program that combines technology and education. The League of United Latin American Citizens has received more than $2 million to develop community technology centers in low-income communities. According to the Committee to Encourage Corporate Philanthropy, corporate funders are looking to have an international philanthropic presence too. But it’s not just about establishing giving programs abroad. Ysaguirre explains, “For corporations like Boeing, which are global companies, we are beginning to see this exporting of ideas of what we do but also of the importing ideas as well. What are best practices in other regions. Again, another practice with implications for Latinos since giving abroad is more likely in those countries where a company has a significant business presence. Giving USA Foundation states in its “Giving USA 2008” report that there is more U.S. corporate giving in Asia and less in Latin America and the Caribbean. There is also talk among funders about employee participation (volunteerism), collaborations, impacting public policy . . . and diversity. How do these impact the Latino community and Latino nonprofits? Experts point to several reasons for this under-funding. Ricardo A. Millett, who has worked in the philanthropic field for more than 40 years and who provides consulting services to foundations and nonprofits as principal of Millett and Associates, observes, “There is a continual challenge to get corporate foundations to be more responsive to [issues of] social justice and equality.” While he points out that all corporate foundations and giving programs have lofty mission statements, he believes they need to apply a methodology to their giving that is more authentic to benefit marginalized communities. Millett is also quick to point out another contributing factor to our lack of ability to claim a fair share of charitable dollars from corporate funders. “One can immediately say it’s because we own or manage very few of these resources.” Others in the field agree with him, noting the need for more Latinos in decision-making positions. This is beginning to change, thanks to efforts by such advocacy groups as Campoamor’s Hispanics in Philanthropy. HIP was founded in 1983 to build bridges between organized philanthropy and the Latino community. It shares information with funders about the Latino community’s needs and issues as well as serving as a referral service to those looking for qualified Latinos for their boards and staffs. First, it leverages each funder’s dollars. Instead of one foundation, one grant, you get several funders and several grants supporting a project. “You also leverage ideas, the knowledge and the capital of the other institutions,” adds Campoamor. She also notes that you lower your risk. “In other words, if I am a national funder and I want to make a grant [to a project] in the Central Valley of California, if I pool my dollars with a local grantmaker, the grantmaker usually knows their community and is more likely to pick better projects. You enhance the likelihood of making good, effective grants. “HIP’s contribution to the field was to start a collaborative to address the historic under-funding of Latino nonprofits. We adapted a method that had been used in philanthropy for many years, and we have used it to grow capacity of Latino nonprofits, especially the ones that are small and that have not been funded in the past.”The HIP Collaborative has raised more than $36 million and has awarded grants to 466 Latino-led nonprofits across the United States. Ramos suggests that by being more proactive, by identifying community leaders as advocates and by developing relationships with foundations, it will be possible to get foundations to focus on targeted initiatives, to set aside money to address such issues as education, health, civil rights and social justice. Then they need to ask themselves if their project is innovative; if it provides the corporation an opportunity to showcase their values. Does it inform public policy whether the issue be HIV/AIDS, immigration or education? Foundations want to know if other resources will be leveraged, the expertise of staff, how results will be measured, and what the future holds once funding has ended.